This month, we have the pleasure of interviewing Milanthi Sarukkali, Ph.D., FSA, from Sri Lanka. Milanthi is an independent consultant working within the insurance industry in Sri Lanka. She is the former Chief Actuary and Chief Risk Officer at Allianz Insurance in Sri Lanka. In her consulting practice, Milanthi is helping local insurance companies establish sound ERM practices and develop actuarial functions in-house in preparation for upcoming regulatory changes. She supports traditional functional areas such as valuation, pricing and product development and finance, She also works with Linear2, a company that provides data analytics solutions, as a specialist in insurance. 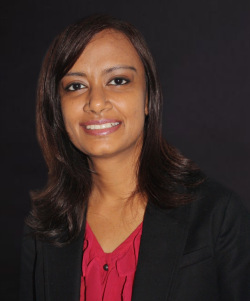 In addition, Milanthi is a lecturer in the Masters program in Actuarial Science offered by the University of Colombo. Milanthi obtained her fellowship in 2012, and also holds a Ph.D. in Mathematics from the University of Connecticut. She has been a volunteer with the SOA examinations committee since 2013 and is also an editor of the International Section newsletter. Milanthi is also a committee member of the Actuarial Association of Sri Lanka. Milanthi Sarukkali (MS): The Actuarial Association of Sri Lanka (AASL) has 14 fellow members, 18 associate members and 49 ordinary members as of year-end 2014. However, most of the fellows are not practicing in Sri Lanka. Three fellows, 10 associates and 49 ordinary members practice in our country. Other members of AASL are mostly consultants attached to foreign consulting firms who work with local companies. Given the lack of fully qualified actuaries practicing in Sri Lanka, most companies have to engage foreign consultants for product development, regulatory filings and other basic requirements. MS: Even though the national languages of Sri Lanka Are Sinhala and Tamil, the business language of Sri Lanka is English (businesses use English as the primary language). The word "actuary" generally comes up only in formal documents, which are in English. We use English words in place of Sinhala or Tamil words in informal speech such as in conversations, so the English word "actuary" is used. MS: Actuarial science was introduced in 1962-1963, with the nationalization of life insurance. MS: I enjoy the technical nature of the work I do. Each project is different, and constantly challenges me to come up with creative solutions. But what I enjoy the most is that I get to be involved in work that has a direct impact on society. My work is primarily concentrated around life and health insurance. Insurance is a social protection mechanism that mitigates the effect of external events. Especially in developing countries like Sri Lanka, it provides financial protection for unforeseen financial losses that can sometimes indirectly impact several generations of a family. Insurance provides financial stability in such circumstances, and supports people in the lower rungs of the socio-economic ladder to attempt to reach the next level. MS: The Actuarial Association of Sri Lanka (AASL) was formed in 2008. We have organized 2 major seminars in the past, one covering ERM in 2010 and one with the theme "shaping the future of Sri Lankan insurance industry" in 2014. These two were very successful with active participation from the profession and insurance industry. In addition to these, we have organized several knowledge sharing events for the benefit of the members of AASL. As study support to the members, we annually arrange classes covering at least 2 subjects, with the help of Actuaries Without Borders (AWB). Foreign volunteers, by request of AWB, come to Sri Lanka and conduct seminars. MS: The main challenge is to obtain full membership of the International Actuarial Association. This requires the AASL to adopt a code of conduct, develop a discipline process and to require all members to complete an education program compliant with IAA education guidelines. Given the limited number of fellow members practicing in Sri Lanka and other limitations in resources, fulfilling these criteria will be a challenge. MS: There are several upcoming changes in the insurance regulatory environment in Sri Lanka. We are moving in to a risk based capital regime in 2016. This has created additional need for actuarial expertise within insurance companies as they prepare to meet new solvency requirements. There have been parallel runs with the current rule based solvency environment for the last two years, over which insurance companies looked to strengthen their in-house actuarial teams, invested in modeling software and also aligned their product strategies with the new regulations. In addition, regulation requires non-life and life companies to be split in to two separate operating entities from 2015. Most companies in Sri Lanka operated as composite insurers offering both life and non-life products until now. This will create more opportunities for actuaries in future. Both these developments in the regulatory environment have prompted an increase in M&A activity within the market. M&A activity is picking up in all of Asia, leading to rapid growth in the industry. MS: As insurers get over the challenges of implementing the necessary framework for reporting RBC as per regulatory requirements, they will begin to focus more on its implications and the need to consider impact on risk based capital when making business decisions. Actuaries will have to play a key role in making all parties aware of the implications on capital and explaining the impacts. Moving to an RBC regime will also make companies increase focus on active risk management strategies. I believe the actuary's role will evolve from the current traditional valuation and pricing work to ERM and developing an overall risk culture within organizations. MS: No state university offers an undergraduate program in actuarial science, although some programs focused on Physical Sciences offer several courses in actuarial science. Two local universities offer Masters programs in actuarial science. The program offered by University of Colombo is designed in line with the Institute of Actuaries curriculum and is currently preparing for accreditation by the Institute, which will allow students to get exemptions from some exams for the courses followed in the masters program. MS: AASL does not have a credentialing procedure of its own, but requires all its members to have at least a student membership with some other actuarial organization such as the SOA or the Institute of Actuaries. Local regulations indicate that a Fellow of a recognized actuarial organization or an associate with 10 years experience can fulfill the role of appointed actuary and provide required certifications. MS: Some employers provide exam support. However, the form and degree of support varies widely among the companies that employ actuaries. It can range from no support at all, to providing 10 days off as study time plus bearing the full cost of study materials and registration fees. I believe we can fill the gap between need and availability of credentialed actuaries if the employers provide better support for students to complete the qualification process. AASL could also provide guidance for employers in developing formal student programs. MS: Not many people are aware of what an actuary is. Even within the financial sector, it is not a well-known profession. Actuaries are held in very high regard among the few who are aware of the profession. AL: You recently made a switch from traditional actuarial work to work focusing on microinsurance. Could you share a little bit about this career choice? MS: I have not completely switched to microinsurance yet, although this is an area I am very passionate about. I feel that microinsurance has a far greater social impact in developing countries. I believe microinsurance benefits both the society and insurance providers in developing countries such as Sri Lanka. Insurance products with investment returns with complicated terms and conditions are difficult to sell in this market and do not address the needs of the majority. Microinsurance, with low premiums is more affordable, people see that it directly addresses their protection needs, and is not so complicated that they mistrust the product.